Daft Anne's steps are a set of rocky pillars extending from the south of Hestan Island in the Solway Firth. In the Story of Hestan Island, published by Auchencairn History Society, Mark White gives the following account. Daft Anne was a person of weak intellect who lived in Auchencairn. In those days the tide in Auchencairn Bay went out further than today and it was possible (but not recommended) to cross from Balcary Point to the south side of Hestan Island at low tide. This saved a long trek round the north end of the bay to Almorness Point and the safer crossing to the north of the island. Needless to say, Daft Anne got drowned on the short crossing. The island has an automatic lighthouse perched on the top. It has two white flashes every 10 seconds and a range of 9 nautical miles. We had great weather on our trip here in January 2005. 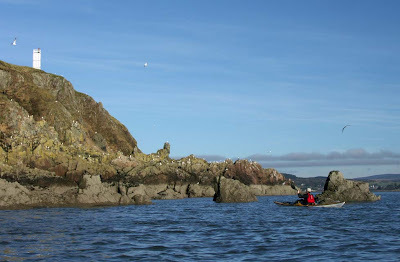 I have just posted a full photo trip report over on the Scottish Sea Kayaking Photo Gallery. We saw blizzards of oystercatchers and two otters playing in the spring flood tide near Daft Anne's steps. The Solway is a great wintering area for many sea birds. 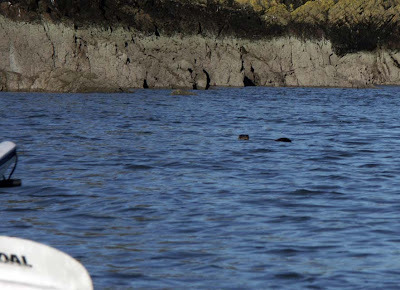 A rather distant otter with its head and tail just visible. Hi Tony we will do the Solway and the Mull of Galloway. Watch out for the next paddles mag, its the Sawney Bean Cave trip you suggested we do together. Sorry for the shameless plug but we own a holiday cottage on the shore or Auchencairn Bay overlooking Hestan Island. We welcome Sea Kayakers and have ample packing and storage for all your gear. We're eco friendly with solar hot water heating. If you mention this blog when booking (in the where you saw us) we'll give you a 10% discount!! Hello Craigshall Cottage, you are very welcome! I have a caraval along at Fleet Bay but I hope that some of the kayaking visitors to this site will visit the Solway it is a great area!